You have a class of talkers: they sit in small groups and will chat about anything and frequently about nothing, their speech filled with “like” and “you know,” devoid of any apparent meaning. But give them a legitimate course-related topic to discuss, such as the national election, and they clam up. When asked why, they claim either they don’t want to talk about it or they don’t know what to say—and they probably are telling the truth in that, not just avoiding the task. So how do you address this, your class who has nothing to say or a way to say it? Why would students not want to talk about the assigned topic when they spend all day, it seems, talking to their peers anyway? It may simply be because it is an assigned topic, and as such it takes away student motivation to begin with. Or the topic itself might be too difficult, too boring, or too abstract for the students to address. All these factors can and should be addressed in designing discussion topics. Another problem is students don’t know what to say on the topic. The reasons for this may be that the students don’t understand the topic, don’t have the knowledge base to discuss the topic even if they understand it, or don’t have the language to discuss the topic—perhaps a little of all three. For example, I generally understand the idea of stem cell research, enough to hold a position on it, but I really lack the knowledge or vocabulary base to get into an extended conversation on the topic without some prior preparation. It is the same for most of our students. One way to really raise student enthusiasm for discussion is to allow students to generate their own topics, with some parameters. So if your recent class reading has been on the topic of the ethics of scientific research, for example, let students design their own discussion questions on the topic: for example, the ethics of spending resources on space exploration when there are so many immediate problems to address on this planet might be a question that comes up. Teachers may offer guidance in design of the questions, but generally students are happy to design their own. One main reason that students don’t want to work in groups is that they get “stuck” working with people they don’t like or get along with. True, a good argument here is that part of adult life is learning to work with people we don’t particularly like. 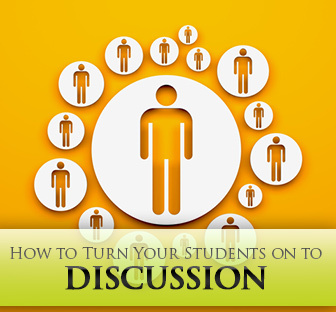 However, student enthusiasm for discussion is raised by occasionally allowing students some input into choosing their groups—once a week, for example. And if they’re trained to choose groups quickly and respectfully, then a lot of the difficulty in the logistics of groups is reduced. Finally a lot of the poor dynamics that can sometimes develop with groups is eliminated because students have chosen the peers they want to work with. Another reason students don’t like discussion is they don’t have the tools for it: they don’t know how to advance an opinion, for example, so they never really get a chance to speak, or they experience rudeness such as other students not listening or disagreeing in a belligerent manner. If students are taught in advance some of the skills of active listening, how to politely break into a conversation and give an opinion as well as how to disagree with another’s viewpoint and still remain courteous, then a lot of the anxiety of group discussion is removed. Once students have some mastery in discussing the topics they have generated, it’s time to move on to academic discussion, a little different in the topics are not student generated, at least at the beginning, and they are not on everyday topics, such as how to manage a busy schedule and get enough sleep, but rather about academic topics such as capital punishment, stem cell research, gun control, and the like. These topics require a certain knowledge base as well as specific vocabulary. Therefore some preparation is needed beforehand, such as lecture and reading, before students will be able to discuss the topic. As their knowledge of the topic grows and they develop an opinion on it, students become more enthused about discussing it. As the semester progresses, students become more aware of other issues to discuss and will suggest these topics to their groups. Motivating students to have a reasonably intelligent discussion, especially in our era of “like” and “you know,” can be difficult. However, through strategies such as student–generated topics and groups and teaching students the tools of academic discussion, teachers can turn our “cool” silent types into articulate speakers. What are some methods you use to create academic discussions in the class?